I was looking forward to this year's edition of what was last year's most difficult and enjoyable rally for me, the WTRA 2 day Beacons rally. Things started for me on Friday because I still hadn't fully prepared the bike after the Powys enduro last weekend. I started off by wiping everything down properly, then greasing everything. I tightened a few spokes, checked almost every bolt on the bike (one exhaust mount was loose) and adjusted the rear brake pedal. Then I re-mounted my handguards because they'd been coming loose at the Powys. Lastly, I fitted a new air filter and had a test ride up and down the field. Good to go! Saturday morning we set off at 7:30am. 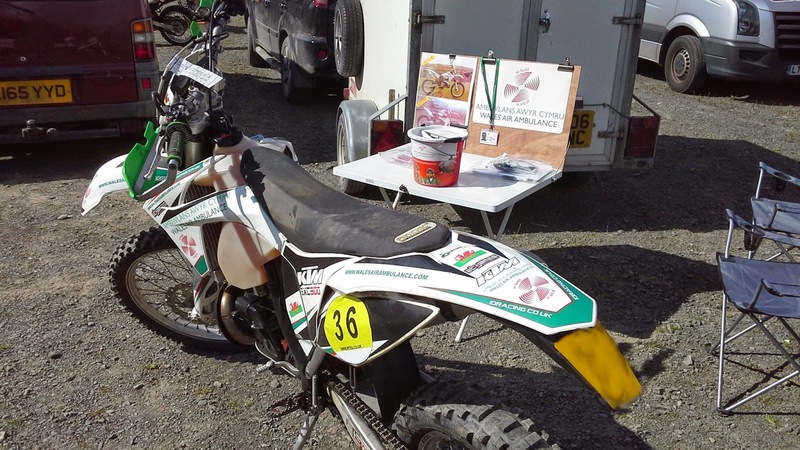 It was sunny and bright which was promising, so off I went to sign on, then I fitted my race numbers (36) and wrote down my times before getting my bike scrutineered. With a start time of 11:12am there was a bit of hanging around, so I caught up with several familiar faces, then got changed and did some stretching. I was a little apprehensive about competing in the Experts class for the first time, but excited to prove myself. Off we went up the very dusty forest tracks, I could already see that visibility might be a bit of a problem during the day, but as long as I rode what I could see it was fine. Not long into the first check and we arrived at the splashes, the best way to describe this section is it's like a mini Strata Florida! Equally capable of drowning bikes though, and a few riders fell foul of the water throughout the weekend. What made it worse for the guys having problems first thing, was that Bob from enduro news was snapping away as we were coming through! Thanks Bob for the great photos. Thanks also to all the other photographers including Keith Bowen, who's photos can be viewed on the MX247 website. The first lap being a sighting lap, I was keen to familiarise myself with the tests and pick good lines, but still keep a good pace so that I had a feeling for the grip and the lines. On the first test though, I hit an unseen ditch on the brow of a small hill (and on a corner) and the bike and I veered off into the shrubbery. As if in slow-motion, I had time to process the thought "there's a tree there, do I go for the brake or bail out". I went for the brake in the end, which was just as well! I avoided the tree and so did the bike, thanks to a big bramble bush which slowed me down. I picked up some foliage along the way so I pulled off the track, ripped it all out and carried on. I was laughing to myself inside my helmet and reminded myself to remember that one on the next lap! Both tests looked good from the sighting lap, although there was very little grip to be found anywhere, particularly on the fire roads. Partly down to my badly worn tyres, but mostly down to the very dry conditions. They were tricky in places, with long, deep ruts to negotiate as well as rock ledges, climbs, descents, water, slippery grass and high speed fire road, there was a bit of everything. Onto the second lap and when we arrived at the first special test it had been "cancelled" for that lap. Unfortunately a rider had crashed on the test and injured themselves, and the ambulance was tending to them and therefore unavailable. I wish whoever it was a speedy recovery and hope it wasn't serious. The rest of the day was good for me, occasionally I was held up on the tests, but apart from a mistake on one special test where I spun off the forest track into a ditch, it went OK.
Back home we went and as soon as we arrived I unpacked my gear and hung it all out to dry, cleaned my goggles and all the usual preparation. I unloaded the bike so that I could check it over, the air filter was a little dusty but not bad so I left it in, then I greased everything and checked the chain tension which was still OK. I mixed my fuel ready for the next day and topped up the bike, then loaded it back up again. Time for a beer and a sit down! Sunday morning and I was up at 5am. The weather had turned overnight as the remnants of a large storm was going to spend the day in our company. The rain on the way to the start area was epic, I've rarely seen anything like it, and it continued for a while after I arrived, while I was unloading the bike. Oh well, at least I had my wet weather gear with me! My start time was 09:12 and off we went for the sighting lap. The course was a little easier in reverse but still had some challenging climbs and descents, not to mention the now deeper water splashes! Speaking of which, on the first deep puddle of the day, someone came rushing through to overtake me, then crashed in the middle of the puddle and took me out as well! I wasn't impressed but I checked he was alright and then 'showed him my back wheel'. The tests were surprisingly grippy compared to the day before despite being a bit rough on the common line, so we were all set for our timed laps. Goggles were proving to be a problem early on, the rain was so heavy and with branches over-hanging the course everywhere, it was almost impossible to keep them clean. By the time I got to the first test on the second lap, I'd run out of roll-off film already! I decided to clean them as best I could because some goggles are better than no goggles. That was my biggest mistake of the day, I got through the first section of ruts and I couldn't see a thing! I had to take a chance and remove my goggles, not ideal as you're riding along. I reversed them as I always do and hooked the strap onto the front of my helmet underneath the peak, but it wouldn't stay there, I'd already lost about 20 seconds by this point so with one eye covered by the strap I just twisted the throttle and attacked the fire road section, using my left hand whenever I could to try to move the strap away. I eventually got it out of the way, but it continued to drop over both my eyes throughout the test, it was a nightmare. I was totally frustrated by it by the time I got to the end and ripped them off and chucked them in my bag. What a waste, I must've lost a good 30 seconds on that test. I rode the rest of the lap including the second test without them (again, not ideal), but I had a fairly good test so I was reasonably pleased. On the next lap I was very careful on the going to keep my head as dry as possible and avoid every single branch I could, it was time to play a game of goggle/glove management! This time when I got to the tests I had dry-ish gloves and clean goggles with half a roll of film left and that gave me confidence. I had two really good tests on the last lap, pushing the bike as much as I dared, wheelies, jumps and power slides aplenty. I hope that was enough to make up for my mistakes earlier in the event! All in all I think the event went well for me, I hope I wasn't the only one to have a bad test amongst the 7 we did, so my fingers are crossed for a good result, and I hope I managed to stay with the rest of the experts, there were some very talented riders in attendance. The bike was great as usual, apart from not wanting to start occasionally, but I suspect that has something to do with the water crossings. The only damage to report is that my kill switch seems to have stopped working, they're not great anyway so I may end up wiring in a different style one before the next event, unless I can fix this one. I'd like to thank everyone who very kindly visited my Wales Air Ambulance stand throughout the weekend and donated and/or bought badges. There is always a fantastic atmosphere at the rallies and everybody is a new friend waiting to be made. A big thanks too to the WTRA club for putting on the event, it was great fun and a fantastic course. 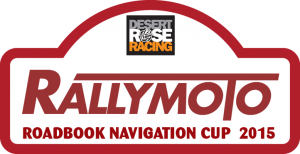 I'm already looking forward to the RallyMoto Tarenig Rally at the end of September, rally on!